Lady Davis, born Marion Mitchell, in Wellington, New Zealand in 1876, was a child opera star, beginning her career in a juvenile opera company at the age of 14. In 1899, Ms. Mitchell married Ernest Hyam Davis, a brewer from Auckland. As a wife and mother, she actively participated in a large number of civic and charitable organizations, and became Lady Davis in 1937 when her husband, a former mayor of Auckland, was knighted, “Sir Ernest.” Together, they were generous donors to Auckland Hospital and to medical education. 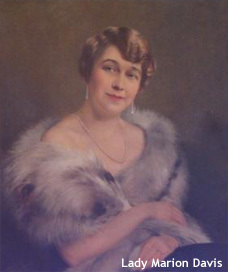 Lady Marion passed away in 1955, and five years later, Sir Ernest Davis gifted Auckland the Marion Davis Memorial Library, later known as the Ernest and Marion Davis Memorial Library. The Davis family’s philanthropic trusts have benefited many private and public organizations within New Zealand and abroad. Guardian Trust, the New Zealand wealth management and trustee company which manages the Davis foundation, selected the Sarah Wetsman Davidson Tower for a $250,000 gift on behalf of the Lady Marion Davis Memorial Foundation trust, after being approached by a supporter of Hadassah New Zealand. Historically, the Guardian Trust has given many grants to hospitals in New Zealand and in Israel. “We recently learned about Hadassah as a center of excellence across many fields of medicine, and were particularly impressed by its outreach programs and pledge to treat people of all religions and backgrounds without prejudice,” explains Rasmika Maharaj, Client Manager at Guardian Trust.